The Great Gulfcoast Arts Festival is one of the best-regarded, most popular arts festivals in the United States. The three-day, juried art show draws more than 200 of the nation's best painters, potters, sculptors, jewelers, graphic artists, craftsmen and other artists. The Festival is ranked #30 in the nation by Sunshine Artist Magazine. Live musicians hit the right notes from the Main Stage with sounds ranging from bluegrass to Cajun and blues to jazz and classical. Performing companies, dance schools, community groups, and area folk groups have their time to shine. Craft artists demonstrate traditional arts, crafts and trades, including blacksmithing, engraving, spinning, weaving and other skills in the Heritage Arts Area. Children become artists at the Children's Arts Festival with numerous hands-on art activities. All children's art activities are free, fun, and geared toward children toddler age and older. The Student Art Show showcases the talents of both private and public school students of Escambia and Santa Rosa Counties. Over 2,000 pieces of art from elementary, middle and high school students will be on display. From traditional treats at the Heritage Festival to local favorites and regional festival fare, there are delicious dining and drink choices for every taste at the Festival! 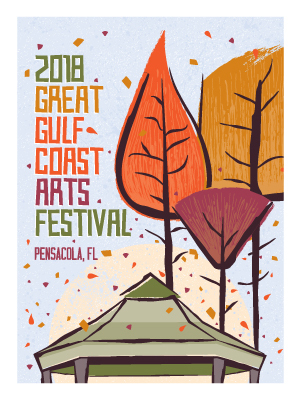 Each year, the Great Gulfcoast Arts Festival sponsors a design competition to select the official GGAF poster. The design is turned into a limited-edition poster, t-shirts, and other items which will be available for sale at the festival. The poster and shirts have become local collector’s items. The only way to get them is at the Festival. A design by Michelle Corley was selected for the Festival Poster for 2018.